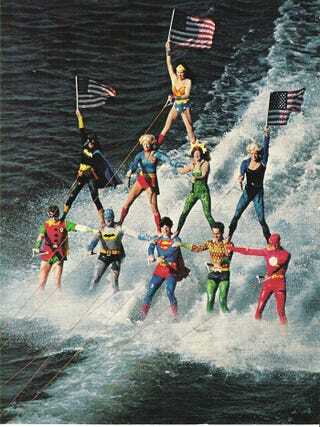 A few weeks ago someone posted the above picture and it immediately elicited a synaptic jolt that shook lose an ancient memory I had of seeing a superhero water show when I was child, sometime in the 1970s. I finally decided to pursue this recollection and, sure enough, when I searched the subject matter and included my home state of Ohio, it turned out that Sea World ran these shows in the 70s and 80s both at that location and in Orlando, Florida. I don't remember much about it other than a vague feeling of exhilaration at seeing my favorite heroes do daring tricks in the water as they foiled the plots of the Joker and Penguin and whoever else. This would have been a time when I was watching the 60s Batman series and the Super Friends cartoon religiously on Saturday mornings. One of the wonderful things about the internet age is that it forms a very sweeping, very deep prosthetic memory and you are able to find these little cultural artifacts preserved on someone's website that are all but forgotten now. Marc Tyler Nobleman has a 10 page (!) tribute to this water show on his blog starting right here. This is where I am drawing all these all old photos from which are amazing. The thing I love about these photos is you get a good sense of the innocent fun and naivety surrounding comic book heroes back then. It wasn't about enormous corporate leviathans and slick media events. It was all pretty goofy and unassuming and I kinda miss that.